The first record of a school in Llangollen comes around the year 1700 from the St Collen's churchwardens' accounts. At this time, the sum of 8 shillings was paid for mending a door between the church and the school, indicating that, at the start of the 18th century, the school was attached to the church. In 1726, there is another mention when 1 shilling and sixpence was 'payd for a warrant to remove ye schoolmaster'. 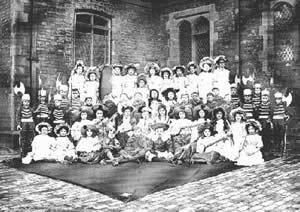 Another early reference to education in Llangollen was that of the Dame School run by Maria Edwards, wife of the infamous Barber of Llangollen who cut his wife’s throat in front of the children. In the 19th century, W.T. Simpson wrote of the existence of a school in the churchyard (which had been founded in 1773). In 1840, this developed into the National School. 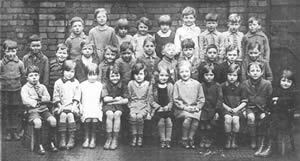 The 19th century also saw the opening of schools in the outlying villages of Llantysilio, Pentredwr, Eglwyseg and Garth, some of which have closed and some that are still going strong. In the 19th century, W.T. Simpson wrote of the existence of a school in the churchyard (which had been founded in 1773). In 1840, this developed into the National School. Following the education act of 1870, the school was greatly enlarged and the new building opened in October 1873 with a procession led by a drum and fife band. 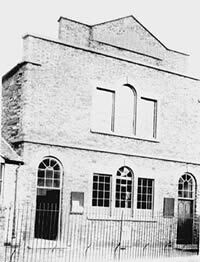 The British School was opened in 1846 having moved from its temporary accommodation in the Rehoboth Chapel. One of the first students at the school was Mary Thomas, who was born in 1842 at Ty Issa Farm, Llangollen. She came here, to the school along with 200 other pupils. With her she brought her pet lamb Billy who apparently caused mayhem in class and had to be put out into the playground. Mary’s schoolmates used to pat the lamb through the railings of the playground. In 1861 Mary married Thomas Hughes, a mining engineer from Cefn Mawr and they went on to have 11 children before Thomas died at 47. Mary lived to be 89 years old and died in Worthing. She is buried here in Fron Bache cemetary, Llangollen, along with her father John Thomas, and on the tombstone is the inscription “Also in affectionate remembrance of his daughter Mrs Mary Hughes who died in Worthing in 1931, aged 89 years old. Heroine of the nursery rhyme Mary had a little lamb”. This is a lovely folklore story, but sadly Mary Thomas of Llangollen was not the heroine of the nursery rhyme. Why she died believing she was is not clear. She was given a copy of the poem by visitors from London – did this copy lead Mary to believe that she was its heroine? The Mary of the rhyme was Mary Sawyer and the school was the Redstone Schoolhouse in Sterling Massachusetts, U.S.A. The original nursery rhyme was written in America in 1815 by John Roulstone, and was first published in a magazine called Juvenile Miscellany in 1830, 12 years before Mary Thomas of Llangollen was born! The Board School was opened in October 1874 in Parade Street with a procession led by a brass band. Today the building is occupied by the European Centre for Traditional and Regional Cultures (ECTARC). The Board School is now incorporated into Ysgol Bryn Collen at Pengwern. Walton House School was opened in 1887 and provided what we would recognise as co-educational secondary education. 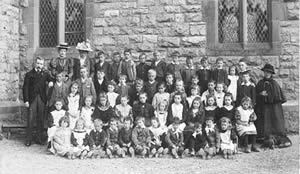 After the 1889 Education Act a committee was formed to secure the establishment of an Intermediate School for Llangollen and district. The governors began fundraising for a new building, but in 1895 opened the school in temporary accommodation in Plas Geraint, formerly the Baptist Theological College. There was now no further need for Walton House, which closed. The site of Pen y Bont field was purchased for the new building, which was completed in 1898 of Ruabon red brick. The County School was opened in September 1898, with the first headmaster being Henry R. Olley. Under his leadership the County School prospered and a new science building was opened in 1913. 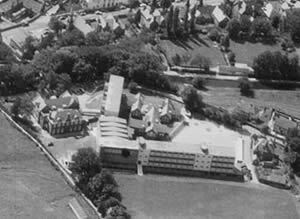 With the 1944 Education Act the school became the Grammar School and, after much new building work, became a bilateral school in 1960, with the name becoming Dinas Brân School. St. Mary’s Church was built in 1871, to relieve some of the overcrowding in Llangollen church and to provide a local school. It stopped acting as a school when the school in nearby Pentredwr was built in 1908, but continued as a church, holding it’s last service in 1985. Ty Newydd, the house next door, was known as the School House, because Robert Oliver, the schoolmaster lodged there. Llantysilio School was built in 1858 on half an acre of land given by Major Charles John Tottenham of Plas Berwyn. The deed stated that the buildings erected on the land were 'to be used as a school for the education of children and adults, or children only of the labouring and manufacturing or other poorer classes in the said parish, and for no other purpose'. An additional cloakroom extension was added to the building in the 1950s. The school seems always to have been an excellent centre for education. In 1914 the school inspection report said 'This school maintains its high reputation for educational standards and religious teaching'. Llantysilio School continues to maintain its high reputation, with over 40 pupils being taught by dedicated staff, a large range of activities and an active after school club. 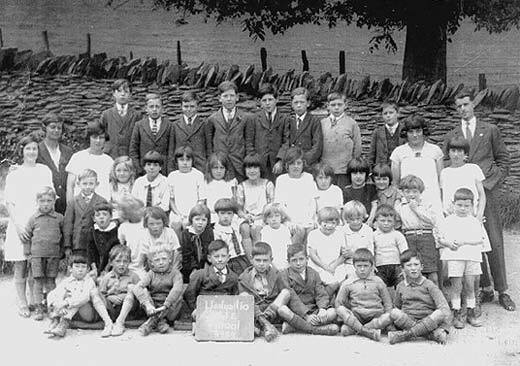 Here can be seen the staff and pupils of the school in 1929. Pentredwr School was built in 1908 to provide a dedicated place for the education of the local children. Catering for between 30 and 40 children over much of its lifetime, it closed in the 1980s.